Dallying In The Dirt, Issue #204--- Little Lotus roots are appearing from the germinating seeds. Sample packets of seed have started to arrive in the mailbox. Is there enough room in the garden to try them all? I always seem to find a bit more room. A Tuscan Baby Leaf Kale from Renee’s Garden tempts me to try it. I freely admit that I have rarely enjoyed eating Kale. I know it’s very popular and healthy but it somehow lacks any appeal on my plate. This variety might be better so I’ll try a small planting maybe in a container where I can continue to cut baby leaves and let it regrow. It’s a very early, cool season crop so I might start that container inside in early April and then move it outside as the weather improves. 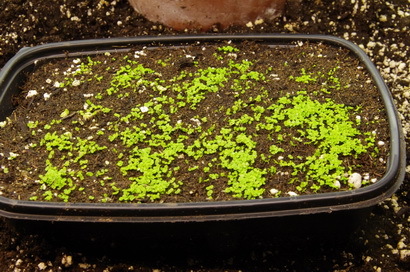 The Begonia boliviensis seeds that I collected last year and planted a couple of weeks ago have germinated quite well and I’ll surely be able to get the 50 or so plants that I want from this planting. It will be another couple of weeks before they are big enough to transplant. The two Lotus seeds continue to grow and do strange things. 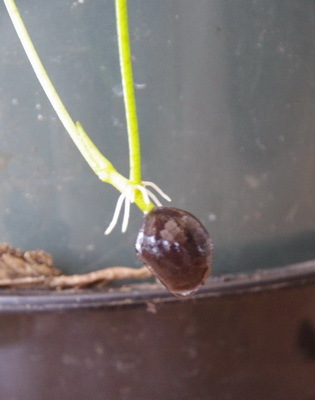 The seeds float up a few cm and the stems curl on top of the water. Today the seeds are again at the bottom of the container and they are sprouting little white roots. These rootlets are not where I expected them to be but they are telling me that it’s time to get them planted into some soil. This will complicate the process as the instruction call for at least a 20 cm (8") pot using a clay soil. That I can do. Now this pot has to be in a container of water that is big enough for it and in which I can have the 35 cm (14") of water. The Assistant Gardener has been observing this process but I’m not certain how she will react when two large buckets of water appear on the solarium floor. Where does one find a quantity of clay garden soil in the middle of February. I was complaining to a garden writer friend about attacking the back yard with a pick axe, when he said, “Wait a minute.” He reemerged from his basement with a bag of very inhospitable bits of soil and explained that he had stored them there when they were digging a hole in his yard. I’ll mix it with a little of my seed starting mix and try to produce the perfect Lotus soil. Now, do I plant both seeds in the opposite sides of one container or try to find room to have two separate buckets of water beside the breakfast table? One of my Rex Begonia, leaf cuttings, now has big enough leaves to see the colours and textures so I will need to transplant it into its own container this week. The Coleus that were moved under the glass in solarium, in order to get warmer, have not been happy there. It’s certainly warmer when the sun shines but is obviously too cool at night. We’ll try something else. The Geraniums under the lights have grown very well and have reached the fluorescent tubes. It is time to cut them back by taking more cuttings to increase my spring Geranium supply. Those of you who live within driving distance of Toronto should be marking your calendars. It is just over a month, until the Canada Blooms show. Lots of fabulous gardens to drool over and a parade of knowledgeable speakers. Come on Wed. the 18th and hear me talk about shade gardening. Spring is a busy season in my speaking schedule as I get to travel to lots of interesting places and talk to hundreds of gardeners about our favourite pastime. Dan Asks? I'm currently wintering over a passion plant. I winter it over under lights in my basement, which is probably less than ideal. I've had the plant for approximately 7 years and it is quite large (6' high). When in bloom the plant produces large 3"-4" plastic purple / pink blooms that emit the most fragrant smell. l want to try propagating the plant by cuttings. I planning on propagating the plant by cuttings What recommendations do you have? Should I take cutting from the older woody stems or the newer stems. Ken Answers! Passion vines root relatively easily from cuttings. I would cut a piece of relatively new green material about 10 - 15cm long and remove leaves and tendrils from the bottom 2/3. 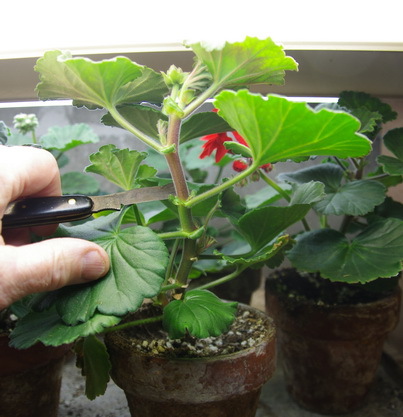 Cut it just below a node and then dip it in rooting hormone and stick it in perlite or a soilless mix. It needs a warm, 20 - 23 C and bright location for a few weeks. Keeping it covered with a clear plastic cover will keep the humidity high enough that it doesn’t wilt. Some people overwinter their Passion flowers in cool dark locations, letting them go dormant and then bringing them back into the warm light in the spring. Good Luck. Bob Asks? Hello Ken I thoroughly enjoy your newsletters. I usually start planting my tomato seeds early to mid March. I caught the tail end of a gardening show and they said to start the tomato seed planting now. Are there any disadvantages to starting tomato seed planting now? I also have a problem with the plants after they have started growing in a portable green house in that they grow tall and are rather spindly. Any suggestions to this problem? Ken Answers! You need to know where the show was broadcast from. Planting tomatoes now will only work if you can get them outside in the next 8 - 10 weeks. Won't be happening where I live. If you start them earlier than that you will need to move them to 6" pots in about 8 weeks and then keep them in a very high light, warm night place. Your spindly plants are probably the result of insufficient light, although too hot or too cool can also be a problem, 65F daytime and 60F night time would be good. Fertilize lightly but regularly and use a relatively low nitrogen fertilizer.